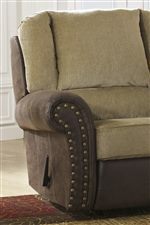 You can have a great look as well as style for your living room with this rocker recliner. A plush seat cushion and divided back in chenille fabric makes for cozy seating. 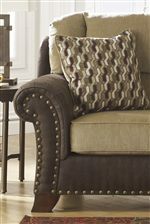 Faux leather covers the rolled arms with nailhead trim, sides, and lower section of the footrest for a two-tone contrast. The Vandive Two-Tone Rocker Recliner with Chenille Fabric/Faux Leather Upholstery by Benchcraft at Crowley Furniture & Mattress in the Kansas City Area: Liberty and Lee's Summit, MO & Overland Park, KS area. Product availability may vary. Contact us for the most current availability on this product. The Vandive collection is a great option if you are looking for Transitional furniture in the Kansas City Area: Liberty and Lee's Summit, MO & Overland Park, KS area. Browse other items in the Vandive collection from Crowley Furniture & Mattress in the Kansas City Area: Liberty and Lee's Summit, MO & Overland Park, KS area.